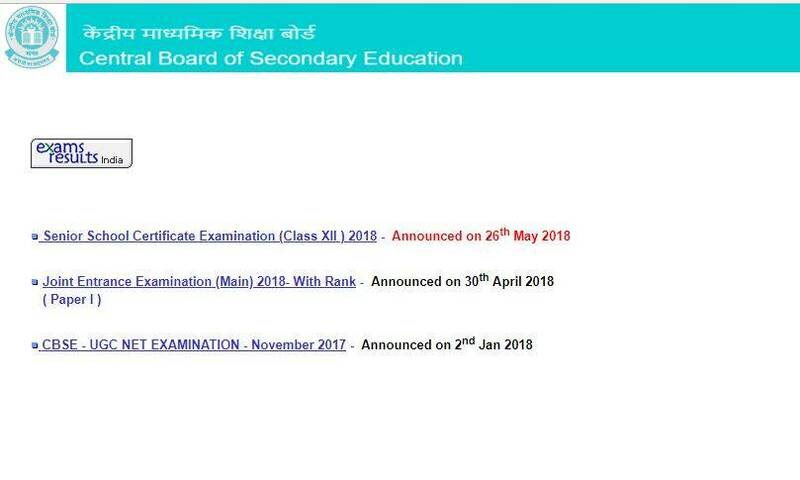 CBSE 12th Result 2018 Live Updates: The Central Board of Secondary Education (CBSE) declared the results of class 12 examinations on Saturday. Students can now check the results on the websites, cbse.nic.in, cbseresults.nic.in and results.nic.in. Out of 11.06 lakh who appeared for the Class 12 exams, a total of 9,18,762 candidates have passed. 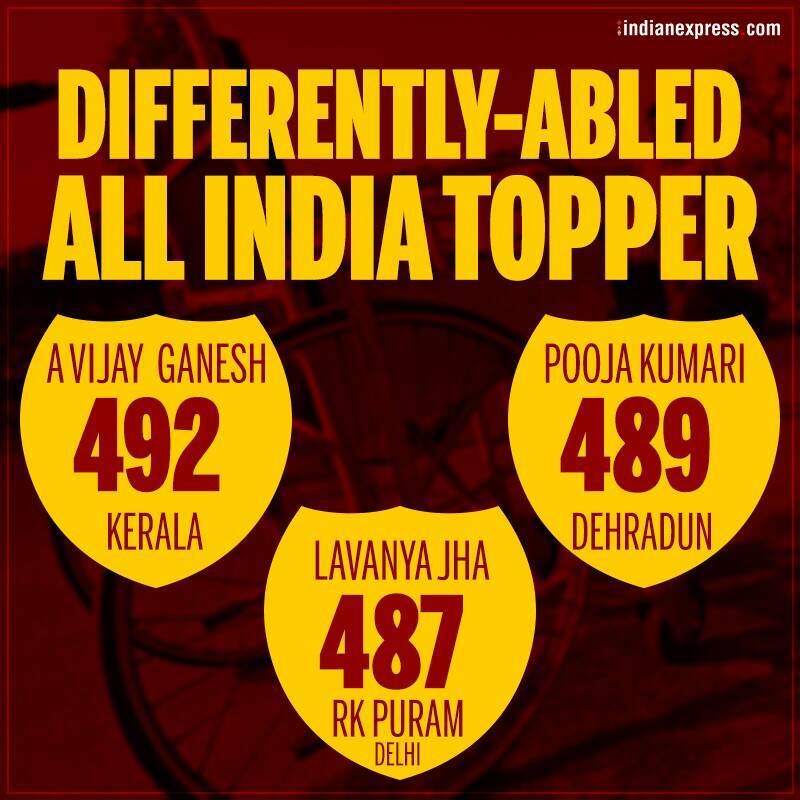 The Trivandrum region has registered the highest pass percentage at 97.32 per cent followed by Chennai at 93.87 per cent and Delhi at 98 per cent. The girls have outperformed boys with about 9.32 per cent. The girls have scored 88.31 per cent while the boys are at 78.99 per cent. The pass percentage of Delhi region has seen marginal increase with 89 per cent this year while in 2017, it was 88.37 per cent. 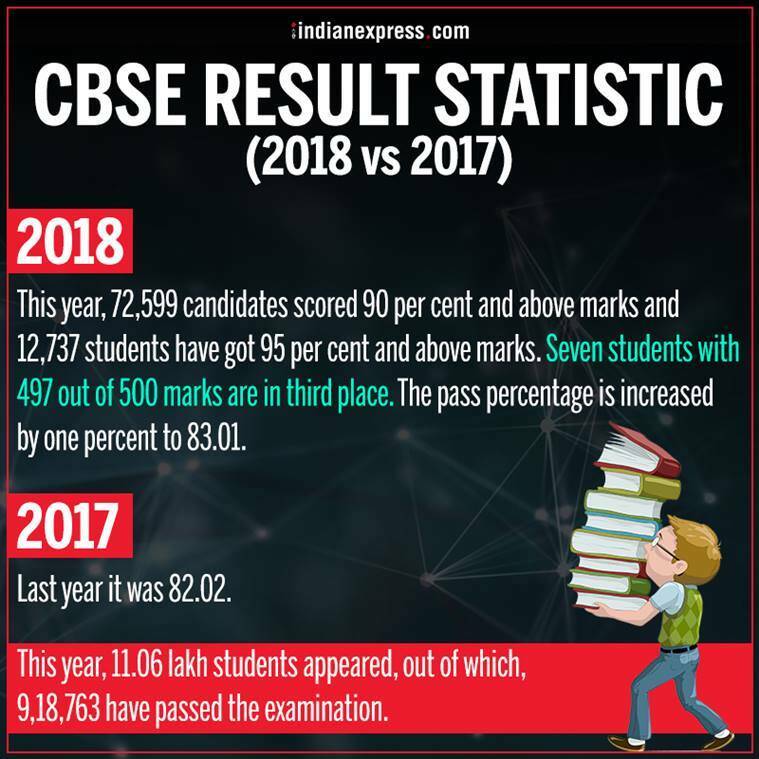 This year, 72,599 candidates scored 90 per cent and above marks and 12,737 students have got 95 per cent and above marks. Seven students with 497 out of 500 marks are in third place. Last year, 10,76,761 students registered for the exam out of which 10,20,762 appeared for it. Of these students, 8,37,229 passed, giving a pass percentage of 82.02 percent, which was a 1.03 percent drop from last year’s 83.05 percent. 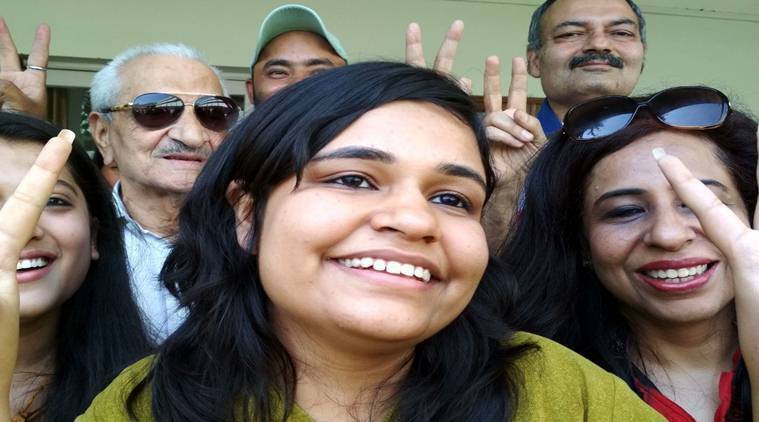 Delhi’s Raksha Gopal from Arts stream had topped the exam. The students can access the Central Board of Secondary Education (CBSE) 12th results at cbse.nic.in, cbseresults.nic.in and results.nic.in. Students are advised to keep their roll number/ hall ticket handy to view their marks. KVS has performed exceptionally well in the Class XII CBSE results- 2018. This year not only the national average of KVS is higher than that of CBSE, but it has opped in the category of all institutions. KVS has scored 97.78% success rate against 95.86% last year. Meghna Srivastava, who has topped the CBSE Class 12 examination, today said there was no secret formula for her success and it was only consistent hard work that had paid off. 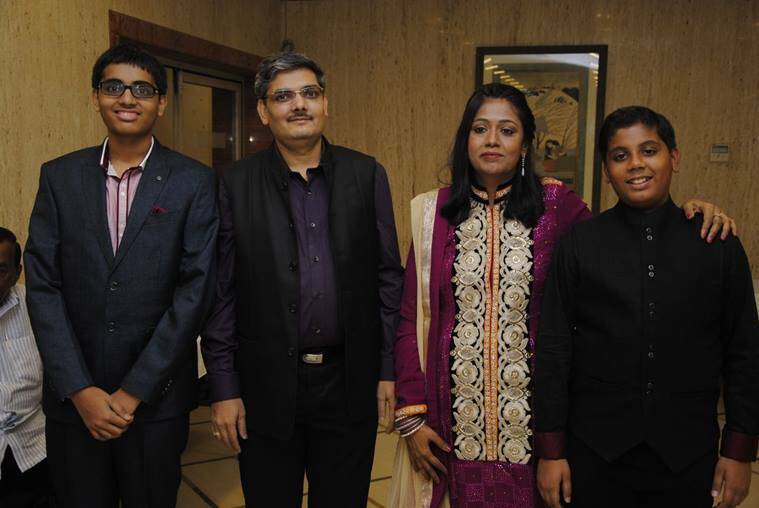 Srivastava hails from Noida and studied at the Step By Step School there. She secured 99 marks in English (Core), while in the other subjects --Psychology, History, Geography and Economics -- she scored a perfect 100. "It's been a really thrilling experience. There is no secret and one has to work hard throughout the year," she told reporters. Srivastava is the niece of former CBI director Anil Sinha, who said that she has always been a bright student. "She has always been a very bright and studious girl. She has brought laurels to our family and we are proud of her," Sinha said. Anoushka Chandra, who stood second in the exam with 99.6 per cent, thanked her parents and her school principal for her success. HRD minister Prakash Javadekar Saturday congratulated those who passed CBSE class 12 exam and also advised those who did not do well not to lose heart. He also said the quality of government schools is improving and congratulated those for a good show. 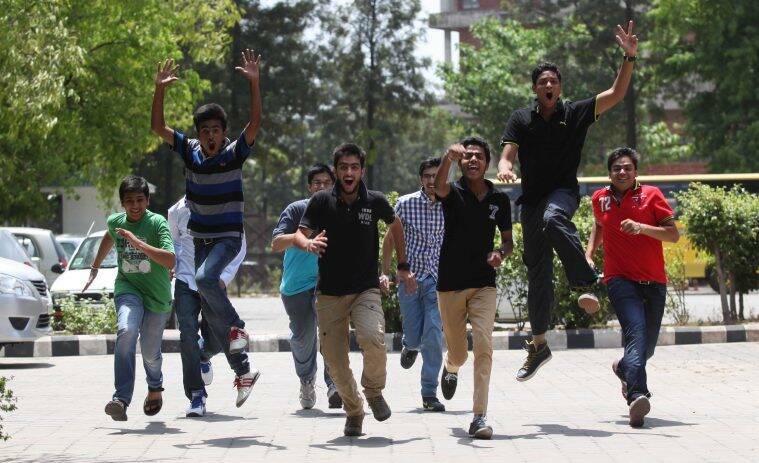 The CBSE class 12 results were announced today. The overall pass percentage was 83.01 per cent as against last year's 82.02 per cent. "I congratulate all those who succeeded. Those who did not succeed, I give them my best wishes because they should not lose heart. This is a temporary setback and they will put in more effort and succeed," Javadekar said. Javadekar said, "I am very happy for Kendriya Vidyalaya and Navodaya Vidyalaya. 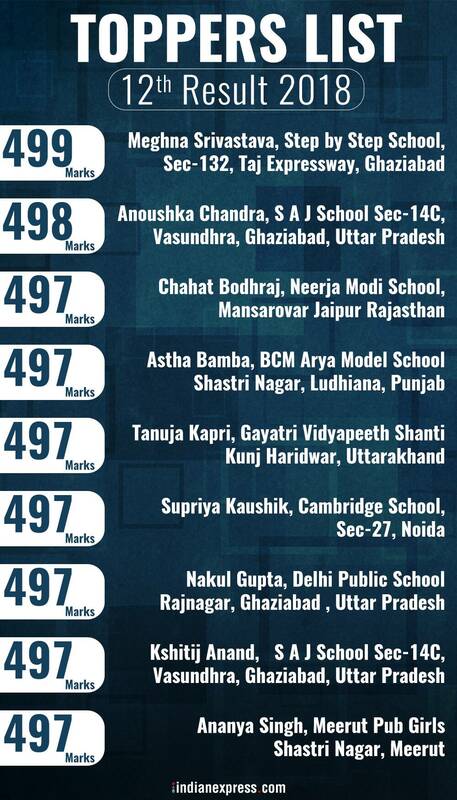 Even government and government-aided schools have scored more than the average result. It is really a landmark moment. The quality of government schools is improving and it's a good news for everyone." 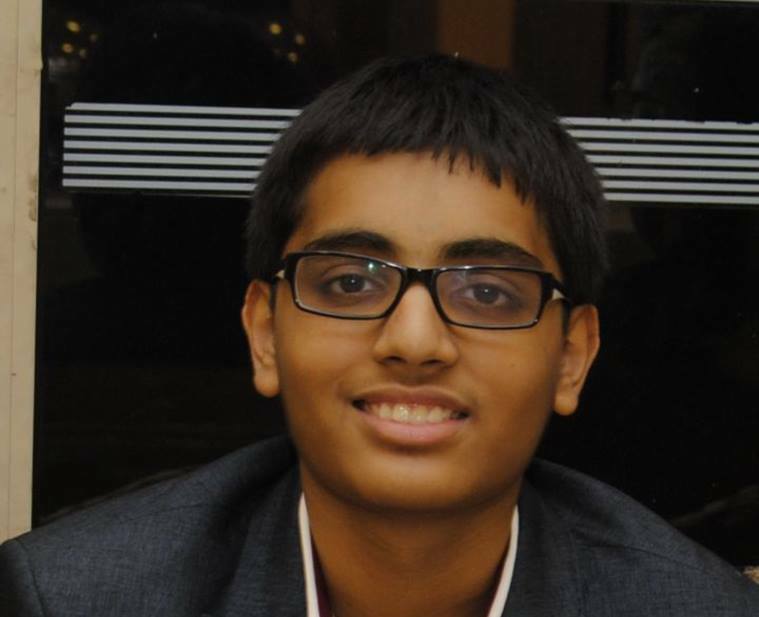 West Bengal CBSE topper Devansh Chandak said that though he is happy, but the performance dropped due to the exam stress. 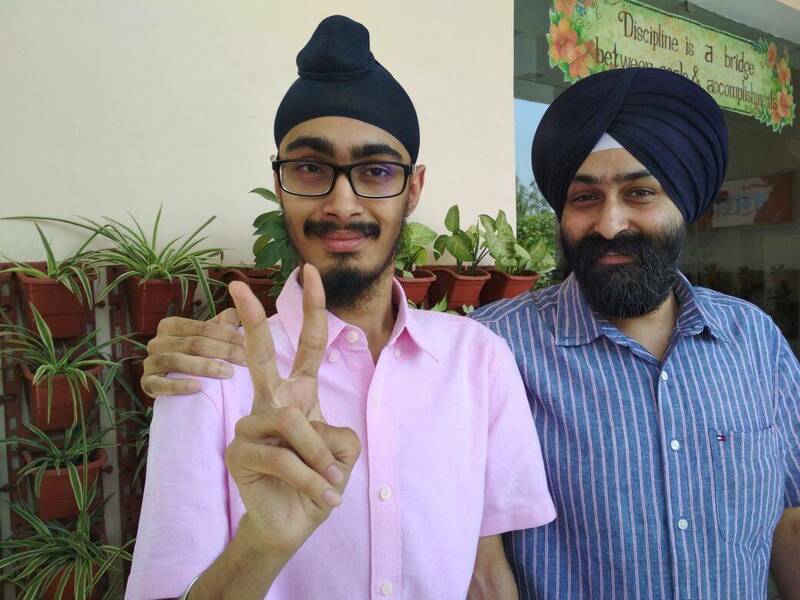 Chandak, a student of Birla High School blamed the media hype for the ongoing stress among students. 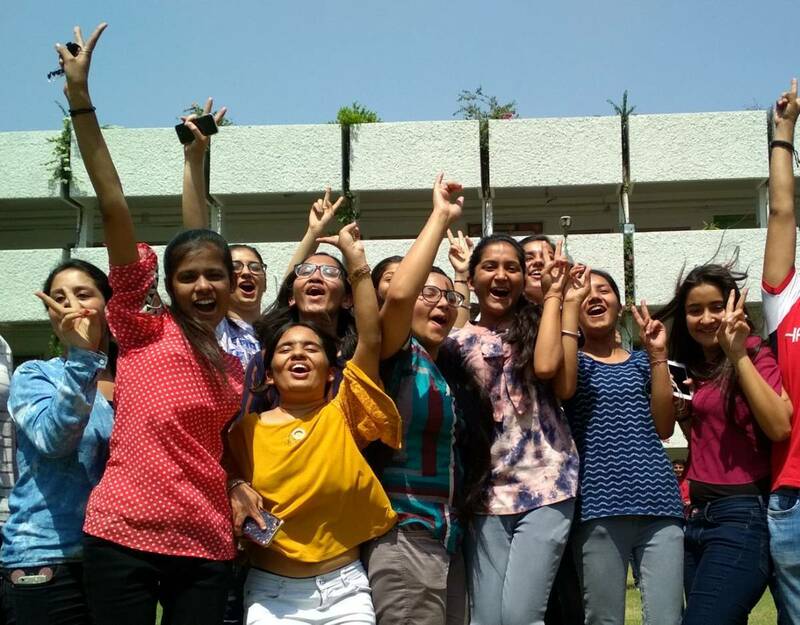 Girls outshone boys in the CBSE Class XII results announced today with Meghna Srivastava, from a Noida school, topping the examination this year. The overall pass percentage was 83.01 per cent as against last year's 82.02 per cent. 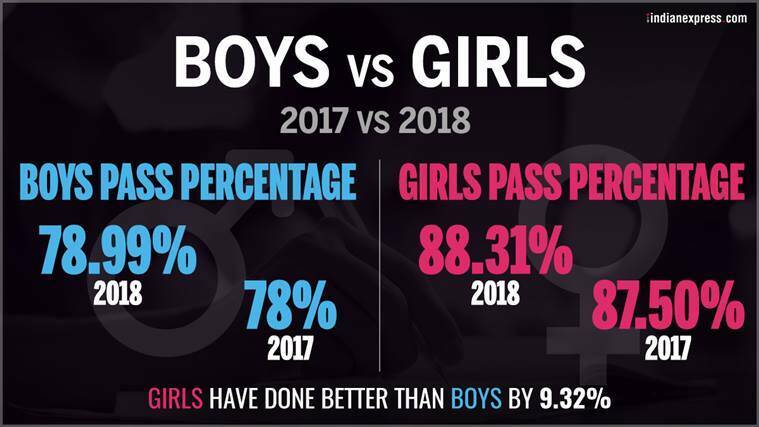 Girls did better than the boys with a pass percentage of 88.31 per cent against boys' 78.99 per cent, officials at the CBSE headquarters said here. 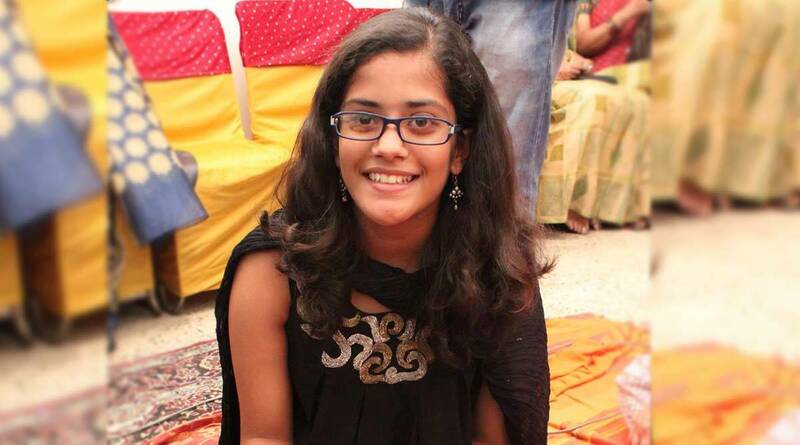 Meghna Srivastava topped the CBSE Class 12 examination getting 99.8%. She secured 499 marks out of 500. She is a student of Step By Step School, Noida, and is from the Humanities stream. The second position was bagged by another girl, Anoushka Chand, also a humanities stream student from a school in Ghaziabad. She got 498 marks out of 500. The third position was held by seven students who got 497 marks out of 500, the officials said. Meghna Srivastava scored 100 in History, Geography, Psychology, Economics and 99 at English core. While the second topper got 98 in English and 100 in rest subjects. Out of 11.84 lakh registered for the exam, of which 11.06 have appeared for the Class 12 exams. A total of 9,18,762 candidates have passed the exam. The pass percentage is increased by one percent to 83.01. Last year it was 82.02. This year, 11.06 lakh students appeared, out of which, 91, 8763 have passed the examination. The result will not be available in the Board and the public are advised not to visit Board’s office for collection of results. The process of verification will be displayed on CBSE’s website . Who will take aways this year’s IPL trophy — Chennai Super Kings or Sunrisers Hyderabad? This is one question that is bothering Class 12 students more than their result. And if the Inter exam results do not turn out as per the expectations of your parents then you might not be allowed to open the television set. The Central Board of Secondary Education (CBSE) declared the Class 12 results today for all regions. The candidates can check scores online and via app and through SMS facility. Over 11 lakh candidates appeared for the exams. 3 CBSE 12th result 2018: Why students don't want Inter results to release today?